I am gobsmacked by this pattern, because it is so genius!!!!! You can find the pattern here, at Sunshine's Creations. 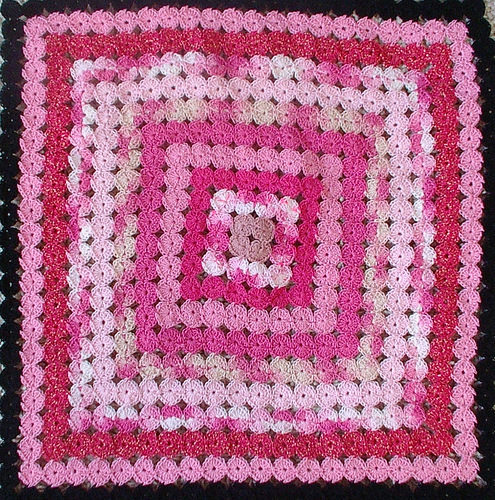 This is the crochet version of one of my favorite quilts, the Yo Yo quilt. I have even seen crocheted yo yo afghans before, but the process was different. Crochet about a million tiny motifs, weave in ends, sew them all together. This one is different and brilliant. She makes a center square of four motifs by crocheting shells into the chain and then turning and making shells on the other side of the chain, which finishes the round motif. Then she starts on the second round of motifs, connecting them as she crochets. The pattern she demonstrates on her blog makes squares of yo yos which are then joined together. By choosing your colors, you could get some really neat combinations here. But some of the prettiest of the afghans on Ravelry that use this technique simply keep on adding rows around and around and around, making an ever bigger single square. This technique is SO COOL that it is all I can do to not run to my yarn stash, pull out a skein and try it NOW. I may not be able to resist for long. I hope if you do make one you share with ravelry and flickr so I can find it and see it. Oh, I will. And I hope it's ok to promote your pattern this way. I think what you've done is just spectacular! super beeeautiful! can't wait to see your version. This page contains a single entry by MamaT published on July 21, 2009 8:16 AM. That Smart Elisabeth Elliot was the previous entry in this blog. Gut check time is the next entry in this blog.